Brining and smoking go hand in hand -- the former prepares the food to receive smoke, and the latter delivers it. Brining improves the texture of all tuna varieties, particularly those best suited for smoking, namely albacore, big eye and yellowfin. These varieties have moderately firm flesh, and brining adds to their plumpness. Two types of smoking produce two types of smoked tuna: hot-smoked and cold-smoked. Cold-smoking occurs at temperatures under 86 degrees Fahrenheit. Hot-smoking occurs at 200 F and above, and is desirable for the home cook, as cold-smoking, unless performed under exacting conditions, keeps the fish in the temperature danger zone too long to prevent bacterial growth. **Trim**: The steaks should measure at least 1 inch thick and have clean lines and a smooth cut surface. **Aroma**: Fresh tuna has a prevailing meaty aroma -- no "fishiness" or canned-tuna odor. **Color**: Deep red to crimson flesh denotes a tune harvested at the height of health. 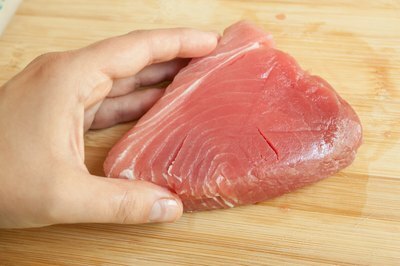 You might see slight discoloration or browning around the bone of bone-in tuna steaks, but it should be faint. Pass over tuna with spotting or deep discoloration. Mix 1 1/2 cups of Morton Kosher Salt with 1 gallon of water. Mix 2 cups of Diamond Crystal Kosher Salt with 1 gallon of water. Mix 1 cup of iodized salt with 1 gallon of water. Iodized salt's grain density is consistent across the board, so brand doesn't influence the brine's concentration. Sugar is optional in a brine. It balances the salinity and creates superb caramelization, but the tuna plumps with or without it. If you choose to add sugar, add 1 cup of granulated sugar per gallon of brine. Heat the brine in a saucepan to dissolve the salt and sugar, if used. Let it cool to room temperature. 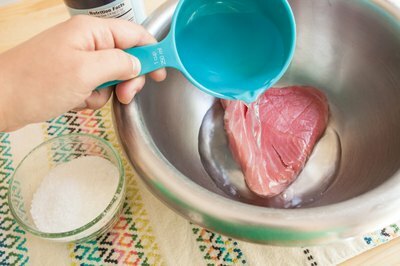 Place the tuna steaks in a food-grade plastic or stainless-steel container and cover them with about 1/2 inch of brine. Cover the container and store it in the refrigerator for 3 hours per 1 inch of thickness. 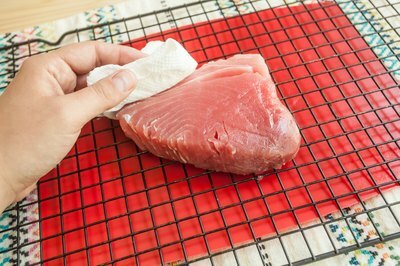 Air-drying is another crucial step in tuna preparation. Air-drying causes a pellicle to form, an ultra-thin, glossy membrane of protein that encapsulates the tuna. The pellicle is tacky, and thus helps the smoke adhere to it. It also helps keep moisture in the flesh during cooking. Pat the tuna steaks dry after brining and arrange them on a wire rack with a little space between each. Air-dry the tuna for 4 hours at about 60 degrees Fahrenheit. If it's too warm to dry them in open air, air-dry them in the refrigerator for 4 to 6 hours. Barbecues vary in their options, but they perform the same basic function and require the same set-up: two-zone indirect heat. The direct zone -- the side with the charcoal -- emits heat, and the indirect zone doesn't -- it's that simple. 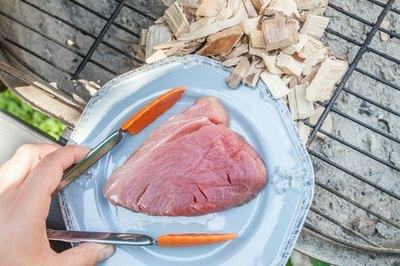 After you set up the grill and get a generous handful of hickory or mesquite woodchips smoking, arrange the tuna steaks on the indirect side of the barbecue and close the lid. Smoke the tuna until it reaches 130 F to 140 F, or about 20 minutes. If you're using a smoker, smoke the tuna at 200 F until it reaches 130 F to 140 F, or about 40 minutes. Environmental factors, such as wind and temperature, affect cooking times. Determine doneness with an instant-read thermometer and consider cooking times rough estimates.